I'll play devil's advocate here and say that for sure we're beating a bit of a dead horse or demon here with the constant regurgitation of what I adore so much: the classic movie monsters. We had Dracula like a million times already. Godzilla has been done twice. King Kong has been done twice. The Mummy has technically been done at least three times. All the other monsters have seen the silver screen at least twice either as sequels or remakes (or both), and it can get exhausting. How much more can we see something 'different' and why? Right? Alas.... I still love my movie monsters, and with THE MUMMY on the brink, good or bad, you know you'll be awaiting the next editions of the same damn monsters we've seen already, and the funny thing is, well, we've seen the exact same thing several times. It was meant to modernize the classic monster the same way Francis Ford Coppola 'modernized' Dracula and Kenneth Branagh reinvented Frankenstein -- only this mummy sought to family-orient a property and make it, well, cheeky. And cute. It's actually not terribly different from that one! Is that a bad thing? Possibly. But is it understandable? Most definitely. 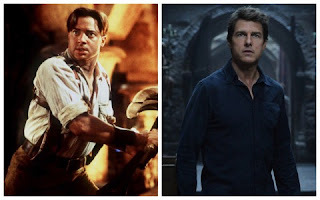 How many different ways can we do a take on the Mummy without losing the classic-ness of the monster, people? And then we want to smack the hands of writers, directors and actors for messing with it. Like you're beating a dog for pooping on the carpet, when that's what dogs do, man. There are only so many ways you can tell the story of the Mummy, and you know what works -- this is about Egypt, lots of adventure, even romance, pits, perils, escapes. In other words: like Indiana Jones. With Brendan Fraser. Or Tom Cruise. So there. The film was a true-to-form homage to the original in every aspect -- the style, the ambience. Hell, it was even set exactly around the same time period as the original B&W with Lon Chaney. Some were ho-hum about the updated 2010 film especially because of that. Nothing new. Nothing original (except for the funky twist at the end with a hairy Anthony Hopkins, which was a little weird....). Same-o, same-o. Again, though, why would that be a bad thing?? After all, Francis Ford Coppola didn't have to get too creative with DRACULA and for the most part stuck with the story to a tee, albeit some interesting thematics and more in-depth character development between Vlad and Mina. But for the most part, sticking with the overall flavor does not a bad movie make. And guess what: we're going to get another WOLFMAN film, presumably with Dwayne "the Rock" Johnson headlining. Interesting. But you can bet this will take the wolfman out of the dark ages and into cyberspace and skyscrapers. Will that be cool? Maybe. 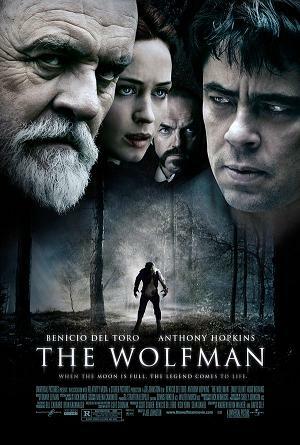 And will that make this 2010 edition of THE WOLFMAN any less awesome? Definitely not. Benicio del Toro, you rocked it. No worries. Celebrate invention. Celebrate reinvention. Creativity. Ambition. Trying something new. Or remaining faithful with interesting visual quality to update the true classic in its entirety. This isn't about comparison. This definitely isn't about what's better, which I'm sure many classic horror movie monster lovers will do as the Dark Universe plagues the movie theaters (in a good way, I hope). This is about enjoying our movie monsters again. And if the films reach us somehow, bravo. That's all we would expect.